LITTLE ROCK, AR. 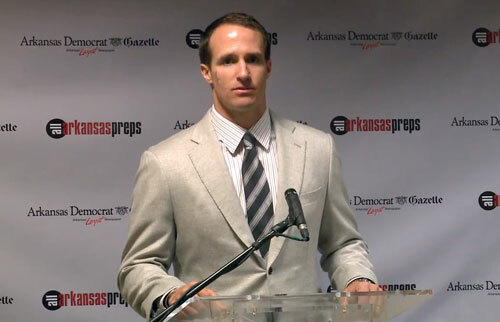 — New Orleans Saints QB, Drew Brees, was the keynote speaker on Saturday, June 7, at the Arkansas Democrat-Gazette’s All-Arkansas Preps awards banquet, sponsored by St. Vincent. According to Arkansasmatters.com, to cite sources, the banquet honors 300 of the state’s best high school athletes in nine different sports. Brees presented the top honors at the event to athletes as well as delivering the keynote. Photo shows New Orleans Saints quarterback, Drew Brees, speaking with the media about concussions in the NFL before the All-Arkansas Preps awards ceremony on June 7, 2014. The Arkansas Democrat-Gazette started All-Arkansas Preps in the 2012-2013 season and the inaugural awards banquet featured keynote speaker Denver Broncos quarterback Peyton Manning. Brees was named the 2010 Sports Illustrated Sportsman of the Year, both for his winning the Super Bowl and his charitable work towards the reconstruction of New Orleans. On December 17, 2010, he was named AP Male Athlete of the Year. Brees is also a popular motivational and keynote speaker. For booking Drew Brees as your next speaker or to book Drew Brees for an appearance or endorsement, contact Sports Speakers 360. For information on how to hire New Orleans Saints players for appearances, call 1.855.303.5450.